today’s post is about an introspective of things most important. with the advent of technology each one of us has evolved as multi-taskers, taking on several tasks and doing it simultaneously with the least amount of time. while it seems to improve productivity, sadly, it compromises quality. it also blurs our focus on things that are most important. so today, as we all face a new day and organize the things we have lined up, move your gaze away from the list. you can keep your routine if you must but think about what matters most to you and spend a little bit more extra time on it. i am sure you’ll enjoy your day a little bit more too. my 11th entry for this project. 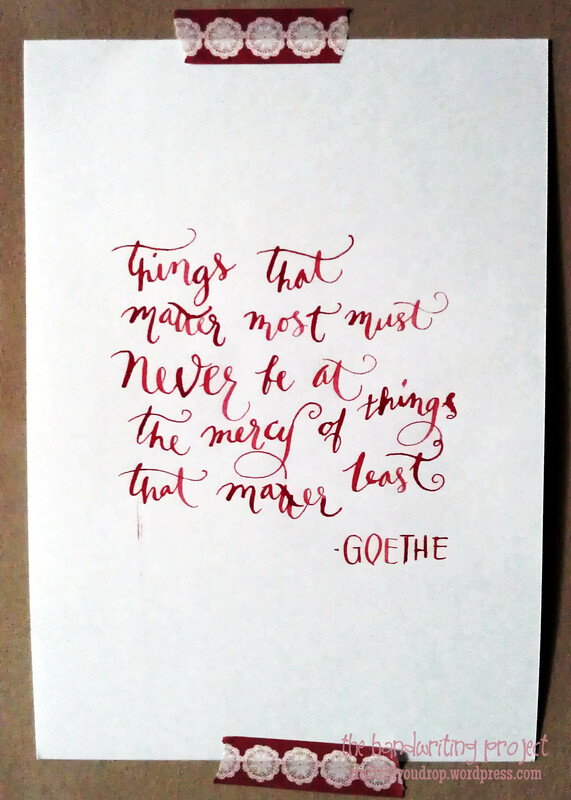 used brause general nib and drawing ink. still with ink blots, sorry. spacing and slants still need a lot of work. 354 to go.